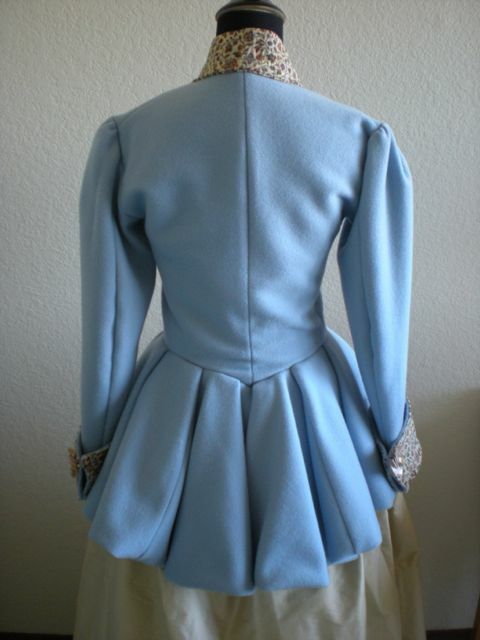 18th Century Inspired Riding Habit Done! I finished my jacket over a week ago but haven’t gotten around to posting pictures because I was wondering if it needed more cockades. (I might save those for a hat). 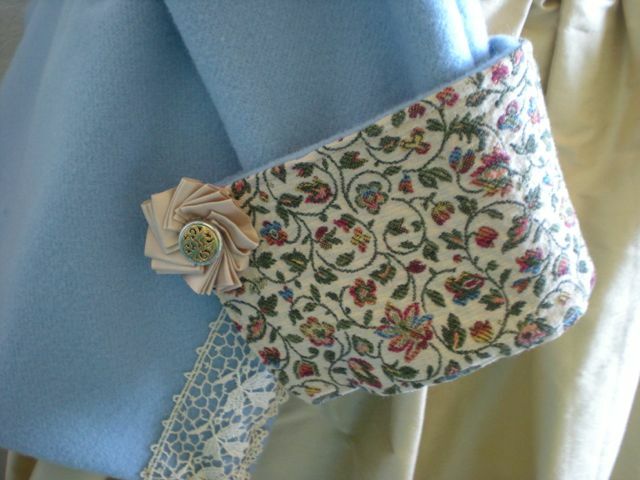 The jacket is made of powder blue Merino wool and lined with linen and cotton. The gold-colored silk skirt was previously made to go with a green dress, hence the ruffled green trim on the bottom. The cotton lace is vintage and was given to me by a friend. 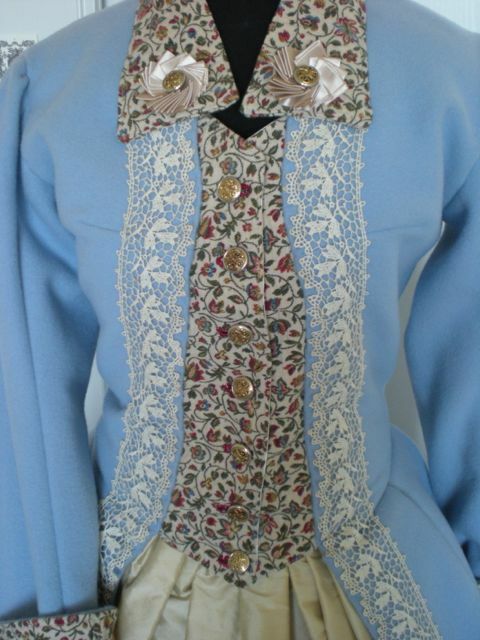 The cuffs and collar are made from the same embroidered cotton jacquard the false vest is made from. 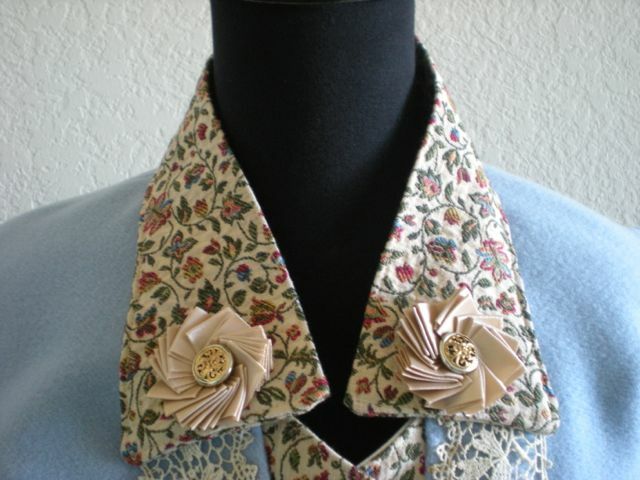 The mini cockades are made from pleated ribbon and gold/silver-colored buttons. 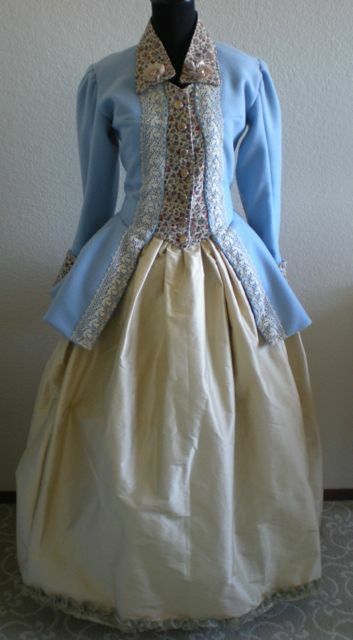 I plan to wear the ensemble at a Revolutionary Picnic hosted by the California Greater Bay Area Costumer’s Guild, along with shoes and stockings from American Duchess. Posted in 18th Century and tagged 18th century, sewing. Bookmark the permalink. As I near the end of my book and am thinking more and more about the cover design, I can’t help returning to admire your beautiful, feminine, riding habit. It is quite the loveliest habit I have seen; the flowered cuffs and false waistcoat are unique. I would love to use the basic design of that habit to picture my heroine standing on a Dartmoor moorside at a very pivotal point in my book as a cover shot. I actually think as a summer habit in linen, it would be very comfortable and practical as well. I have ridden all my life and been a riding instructor for both able bodied and disabled children and adults. I have ridden sidesaddle on several occasions and would like to do so for more in the future. 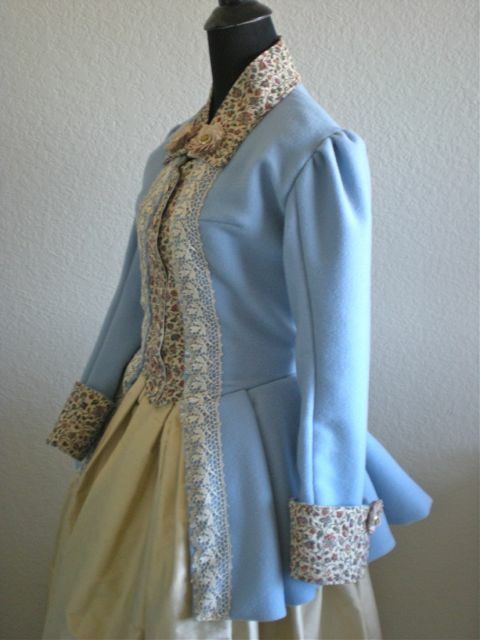 I adore 18th century fashion and have seen hundreds of riding habits from the time period, but, for years, I have found myself coming back to your habit as my favorite inspiration. Would you consider letting me picture my heroine in your habit on the book cover with proper credit and acknowledgements to you. It is simply the loveliest habit I can picture and I think it would make a beautiful cover gown if you did not object. Hi Cynthia, I’m flattered you like the riding habit so much! If you want to use my habit as an inspiration for your illustration of your heroine that is perfectly welcome. I would love to see the cover of your book when it is finished!